Okay, so here you are at step one and you’re serious this time, right? We’re here to give you the push you need to cross the starting line – armed with these workout essentials you’ll be able to tackle the rest. So, what’re you waiting for? First things first, you need the right fuel in the tank to get you on track. 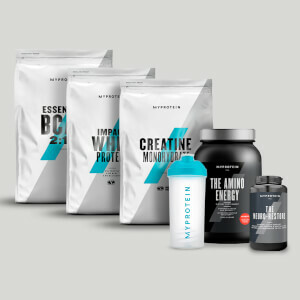 Our formula delivers a massive 21g of protein in every serving, which contributes to the growth and maintenance of muscle mass – a vital support to all your training goals. Available in delicious flavors ranging from Chocolate Caramel Pretzel to White Candy Cane, this shake tastes like a treat! The perfect way to get into gear – our super-charged formula has been scientifically proven to boost your performance in successive bursts of short-term, high-intensity exercise. Don’t let anything hold you back from getting results, take just 3g immediately pre- or post-workout. Break the boundaries with our most powerful pre-workout formula ever. An explosive blend of caffeine, creatine, CarnoSyn® beta-alanine, TeaCrine® and vitamins – this is sure to fire up your focus and propel your performance. It’s never been easier to stay on top of your nutrition! Our leak-proof shaker comes complete with a snap-on strainer for lump-free shakes and screw-on storage for pills and powders – the perfect partner to any training session.